During my childhood I always had a keen interest in martial arts, which culminated in me practising and learning Taekwondo, Kateda and Karate. However I've always had a curiosity in weapons and was disappointed in not having the opportunity to use weapons until I reached an advanced level. I was a regular reader of Combat Magazine and read an article from Master Steve Tappin talking about the concepts of Escrima. I was immediately attracted to the martial art as you learn how to use weapons and transitions between the weapons and fighting unarmed. I was even happier when I realised that Master Steve was offering lessons in my local area Wood Green. In February 1999 I started learning Escrima and my passion for the marital art has grown and developed ever since. I continued training under Senior Instructor Paul Leslie after Master Steve moved to Clacton later that year. In November 2000 I flew to Copenhagen to compete in the Escrima World Championships and received a silver medal. This ignited me even further boosting my confidence. 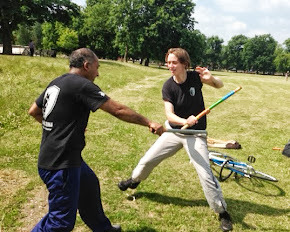 Since then I have continued studying hard and developing my skill as Escrima Concepts evolves. This has consisted in me going to seminars across the UK, Italy, Germany, Holland and Denmark and also assisting in teaching in the seminar circuit. In addition to this, I performed in demonstrations across London and Essex. During this period I've seen many students come and go but I remained focused on improving my ability to use different weapons achieving greater control. I began to teach as an Assistant Instructor under Paul Leslie. Through teaching I am able to deepen my understanding of the concepts, learning body mechanics, fluid footwork and movement. In January 2008 I received my 1st TG and continue to train and teach in London. After 12 years I'm still learning and thoroughly enjoy being part of the Escrima Concepts family. When I'm not training I like to spend time with my son, travel, read books on a variety of topics and support my football team Spurs.